In an episode of Star Trek: The Next Generation, one of the main characters, Captain Jean-Luc Picard of the Federation, is captured by a rival race, the Cardassians.1 His Cardassian interrogator, Gul Madred, uses a number of methods to try and elicit information from him. One of these methods involves four lights: Madred asks Picard how many lights there are; every time Picard answers “four,” he is tortured, and told there are five. (no more spoilers) While the idea that there is a link between depression and torture or brainwashing may be a bit extreme, I like this episode -- and especially Picard’s last words -- because it reminds me that almost everything in life is subjective. Even the most plain-seeming facts, like that there are four lights -- physical objects we can see and touch -- can be fallacies driven into us as a psychological response to external stimuli. These stimuli might not be as intense or acute as torture, but there are some very powerful influences in our everyday lives. Peer pressure, advertising and marketing, religion, and the demands of bosses or coworkers can all change our minds and perspectives, to name a few. 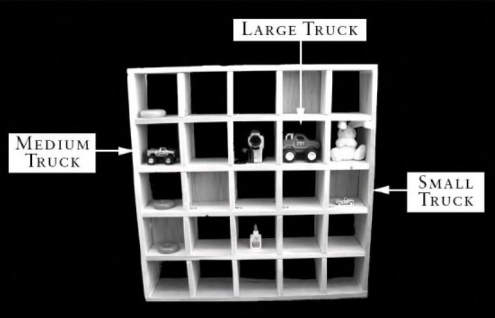 Participants were then asked which truck someone on the other side of the cubby unit would move if they were asked to move “the smallest truck.” Of course, every participant picked the truck labeled above as “medium truck.” But the interesting thing is that, no matter how many times this study was performed, their eyes always flicked towards the “small truck” first. That is, we have a subjective and objective sense of things, and we are willing to sacrifice the objective observation for a subjective one. 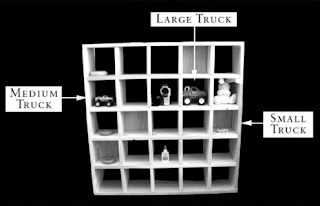 Even though participants saw a smaller truck, they were willing to sacrifice their objective observation for a subjective one. 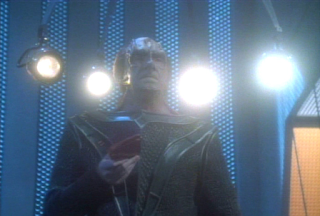 Even though Picard saw four lights, he was willing to sacrifice his objective observation for one that benefitted his subjective situation. Consider also the Stanford Prison Experiment,3 where volunteers assigned to be “wardens” became more violent and authoritative and volunteers assigned to be “prisoners” became complacent and psychologically traumatized; or, Jane Elliot’s “Blue eyes-Brown eyes” eyes exercise,4 where third graders told they had a “superior” eye color teased and refused to play with those who had an “inferior” eye color. But wait, there’s more! Not only are we capable of being tricked and/or tricking ourselves into believing things that aren’t true now, we are also terrible at remembering past truths and predicting future truths. Next, all volunteers were shown two slides -- one in which the red car was approaching a yield sign and one in which the red car was approaching a stop sign -- and were asked to point to the picture they had actually seen. [...] More than 90 percent of the volunteers in the no-question group pointed to the picture of the car approaching the yield sign [which is what actually happened]. But 80 percent of the volunteers in the question group pointed to the picture of the car approaching a stop sign [which was mistakenly identified in the first question they were asked]. - When asked to list missing words from a set, participants thought words related to those in the set were not missing.6 For instance, in a list of words related to sleeping but not containing “pillow,” participants might remember that the word “pillow” was present. If you want to see this effect for yourself, you don’t even have to participate in a study. On any sunny day, go lay outside for 30 minutes. Then, go inside. The indoors will appear dark for some time. Or, the next time you’ll be outside for some time, wear sunglasses and set an alarm for 30 minutes. When the alarm goes off, remove them -- did you even remember you were wearing them? Probably not. Or, try standing in a doorframe with your arms pressing gently against either side for two minutes. Then, move out of the doorframe and relax your arms. If you’re like most people, your arms inadvertently raise themselves from your side. The point I’m making here isn’t that we’re fallible, it’s that we’re malleable. Yes, this has allowed us to adapt to constantly changing environments -- imagine the benefits of night vision one million years ago, when our ancestors lived in caves without flashlights. But it also means we can believe things that aren’t true. We are readily influenced by our physical surroundings, the people we surround ourselves with, and the situations we are in. Indeed, “beliefs, whether good or bad, false or true, can be forcibly implanted in the human brain.” 11 These beliefs can make us sad, even depressed or anxious, but they can also make us happy. Whatever they make us, though, they are just beliefs. For me, depression seems to be the force telling me there are four lights. I sometimes find myself bound by beliefs that make my mind seem imprisoning. Would there be too much consequence in believing that there are, in fact, five lights? Our feelings and beliefs can be a product of our surroundings, not who we are. Every assertion, every piece of evidence deserves equal scrutiny. Can it be tiring? Yes! But if the end result is that we have less reason to be happy than we thought, we know what to change. And if the end result is conclusive proof that we are loved, that we have reason to be happy and celebrate and enjoy life, then that seems well worth it to me. 1”Chain of Command.” Star Trek: The Next Generation. Paramount Domestic Television. July 21st, 1992. Television. 2Keysar, B., et al. “Taking Perspective in Conversation: The Role of Mutual Knowledge in Comprehension.” Psychological Science, II. 2000. 32-38. "Jane Elliott." Wikipedia. Wikimedia Foundation, 3 June 2016. Web. 5Gilbert, D. Stumbling on Happiness. Random House, Inc. New York. 2005. 87-88. 6Deese, J. “On the Predicted Occurrence of Particular Verbal Intrusions in Immediate Recall.” Journal of Experimental Psychology. 1959. 58: 17-22. 7Samuel, A.G. “A Further Examination of Attentional Effects in the Phonemic Restoration Illusion.” Quarterly Journal of Experimental Psychology. 1991. 43A: 679-99. 8Warren, R. “Perceptual Restoration of Obliterated Sounds.” Psychological Bulletin. 1984. 96: 371-83. 9Salkind, N., et. al. Encyclopedia of Human Development. Sage Publications, Inc. California. 2006. 502. 10Kohler, I. “Experiments with Goggles.” Scientific American. 1962. 206: 62-72. 11Sargant, W. Battle for the mind: A physiology of conversion and brainwashing. Doubleday & Co. Oxford, England. 1957. 263.